The Sunrise Rotary Club collaborated with the City of Plattsburgh and the NYS Canal Corporation to locate this community amenity on scenic Cumberland Bay, Lake Champlain. The Sunrise Rotary Club shared the City and Canal Corporation's vision for improving family-friendly lake access at this beautiful spot, located right in the heart of the city. 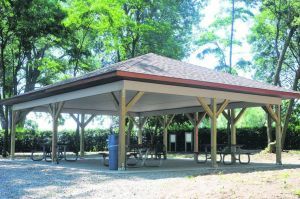 Sunrise Rotary Waterfront Project Committee Chair Victoria Duley said the pavilion makes a wonderful connection with the city, Cumberland Avenue neighborhood and other Wilcox Dock facilities. The club is pleased to help improve the amenities at this growing park which is easily accessible to city residents and will serve visitors from other parts and outside of Clinton County.